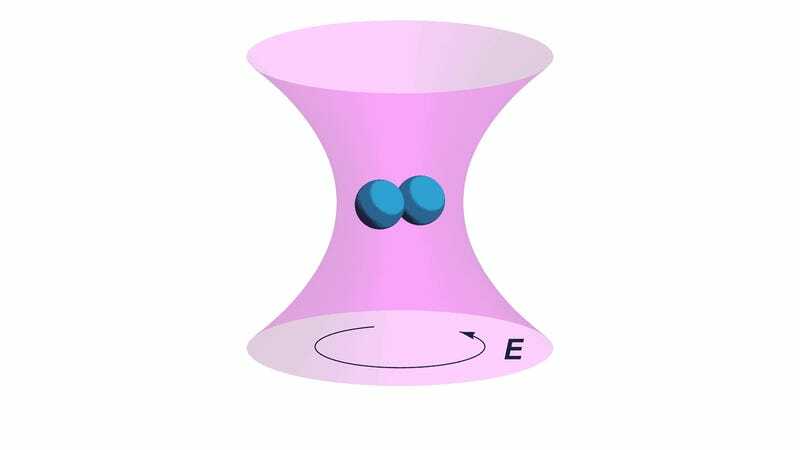 Scientists made nanoparticles that spin around each other a billion times per second, the fastest mechanical rotation on record. They want to use these spinning particles to study the very fabric of spacetime. The two independent teams were studying how light’s energy could make nanoparticles move, and ended up generating incredible spin frequencies. But if the spins are fast enough, it could be a way to measure the friction that particles might feel against spacetime itself. Each team produced their spinning nanoparticle similarly. Li’s team was studying how they could use the particles levitated by light in a vacuum as a torsion balance, a tool that can detect very slight forces. They created and levitated nanoscale silica dumbbells around a hundred nanometers in diameter (the size of a virus) and created their torsion balance analogue—an interesting result on its own. But when they shined the dumbbell with circularly polarized light, or light beams whose accompanying electric field rotates as it moves forward, the nanodumbell started spinning with incredible speed, according to their paper to be published in Physical Review Letters. Again, that’s a billion times per second. The second team’s setup was similar and also used silica nanoparticles, though this group was just having some fun. “We tried it out to see how fast we can go,” René Reimann, photonics professor at ETH Zürich, told Gizmodo. “This was our intrinsic and scientific motivation.” Only after they achieved the high speeds did they think about applications. They measured the spin frequency based on light that scattered off of the particles. The nanoparticle spins so quickly because, in a vacuum, there’s no air to create resistance. The atoms won’t blow apart until the force of the spin overcomes the force holding them together. But there’s more work to do in order to determine how the polarized light transfers torque to the particle, according to Reimann’s team’s paper. Experiments like these could measure the extremes of physics or even mysterious cosmological signals, Reimann’s team writes in their paper, also to be published in Physical Review Letters. But both teams mention that if they cooled their experiments to near absolute zero, they could potentially probe that quantum vacuum and the very fundamental nature of physics. Correction: The headline and text of the article previously referred to the spinning particles as “molecules,” which was incorrect. They are nanoparticles. We regret the error.